A lawyer for Tony Moreno, the Middletown man who was convicted of killing his infant son in 2015, argued in front of the state’s highest court Thursday that his client deserves a new trial because he was medicated and not in the right frame of mind when police questioned him in his hospital bed. 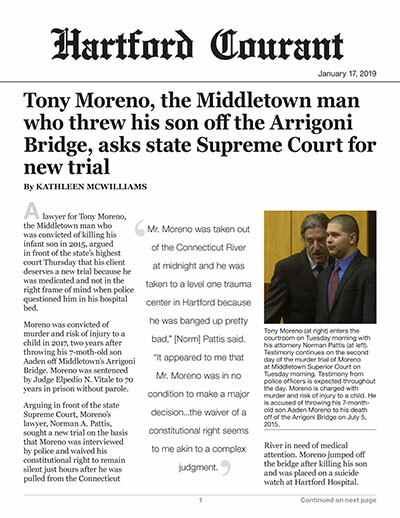 Moreno was convicted of murder and risk of injury to a child in 2017, two years after throwing his 7-moth-old son Aaden off Middletown’s Arrigoni Bridge. Moreno was sentenced by Judge Elpedio N. Vitale to 70 years in prison without parole. Arguing in front of the state Supreme Court, Moreno’s lawyer, Norman A. Pattis, sought a new trial on the basis that Moreno was interviewed by police and waived his constitutional right to remain silent just hours after he was pulled from the Connecticut River in need of medical attention. Moreno jumped off the bridge after killing his son and was placed on a suicide watch at Hartford Hospital. Robert Scheinblum, senior assistant state’s attorney, said that Moreno had “relatively minor injuries” after his 100-foot fall from the bridge. Pattis also said that six minutes of the interrogation, including the portion where Moreno waives his Miranda rights, is missing from a video recording of the interview because of a technological malfunction. Pattis said police are required by state law to record all interviews that take place in police detention. While a hospital is not explicitly listed as a place of detention, Pattis argued that because Moreno was restrained and interviewed by police at Hartford Hospital, police were obligated to record their entire conversation with him. “Taping is used to protect individuals,” Pattis said. Scheinblum disagreed, saying that the Hartford Hospital room Moreno was interviewed in was not a detention facility and not subject to the state law. “A hospital room is unambiguously not a detention center,” he said. Justice Andrew J. McDonald asked Scheinblum why there wasn’t a more clear definition of what constitutes a detention facility. “Why isn’t the term ‘detention facility’ widely understood to be a place where someone is being detained?” McDonald asked. A third area of contention is a letter Moreno wrote before the start of his trial in which he offered to plead guilty to manslaughter in exchange for a 25-year sentence. Pattis said the letter was never shown during the trial and that it deprived the jury of understanding Moreno’s remorse about what happened. Supreme Court justices questioned what value the letter would have added to Moreno’s defense, given that he also testified during his trial. “He was not precluded from presenting that defense during the trial,” Justice Maria Araujo Kahn said. Scheinblum said that the court should uphold Vitale’s ruling that the letter was not relevant to the case. “The judge has the discretion to exclude evidence deemed irrelevant,” Scheinblum said.